Formulated with 66.5% ethyl-alcohol to help you meet CDC, APIC and OSHA hand washing recommendations and aloe vera to add moisture with each use. The individually wrapped p.a.w.s.® towelettes come in convenient mini pouches and pull out canisters. 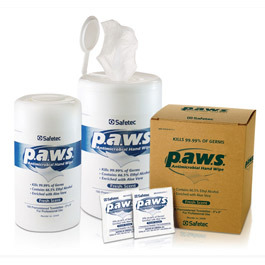 p.a.w.s.® wipes not only kill 99.99% of germs, but they also remove debris and soil from hands and under fingernails, an important function in the absence of soap and water. p.a.w.s.® has demonstrated virucidal activity against HIV and Avian Flu A in 15 seconds. p.a.w.s. Fresh scent pull-out tub dispenser. 50 per container. Cleans and Sanitizes All In One. Effective Against Avian Flu A*, HIV-1, VRE, E. Coli and More. Kills 99.9% of Most Common Germs.